If your boudoir’s design lacks luster, a set of bedding can spiff things up in a cinch. Selected with comfort and style in mind, our medley of shams, duvets, and blankets will keep your bedroom looking smart. 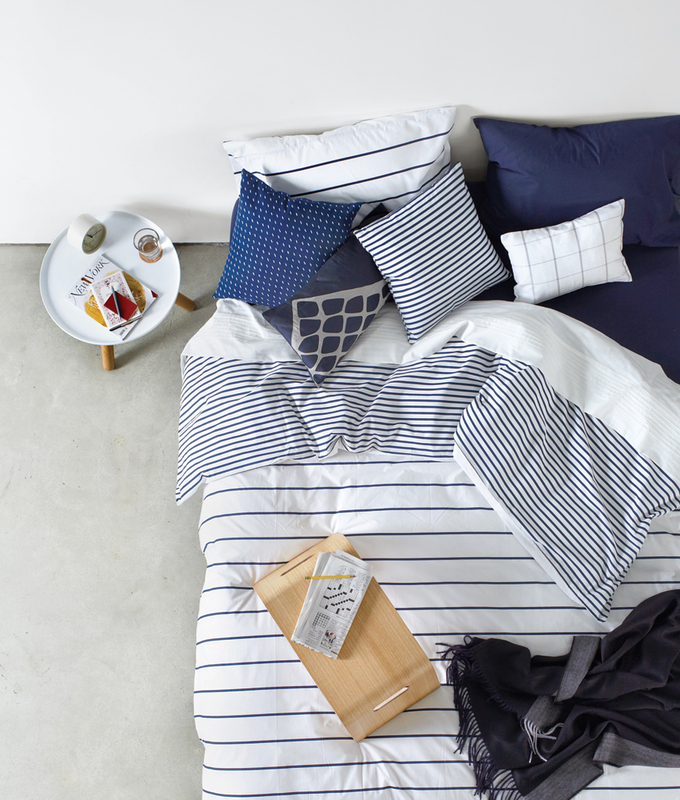 Small Tablo table by Normann Copenhagen, Organic pleated bedding by Loop, Herringbone throw by Boss Home for Hugo Boss, Sailor + Regatta Navy duvet by Unison, Stacked Stones pillow by Coyuchi, Bentwood breakfast tray by West Elm, Riki desk clock by Riki Watanabe. Pillows and duvet loaned by the Company Store. Side table by Urban Hardwoods, Rustic Wood serving tray by Grayworks Design, Crushed Silk shams by Eileen Fisher for Garnet Hill, Egg Press Dot sheet set by Schoolhouse Electric & Supply Co., City throw by Bryce & Co., Ines Duvet cover by Area. Side table by BoConcept, Dvala sheets by Ikea, Mega Dot quilt by Hay, Lisboa throw by Missoni Home, Bloomsbury Basket Weave Throw by Wallace + Sewell, Color Block pillowcases by Scholten & Baijings for Hay, Red Ceramic clock by George Nelson, Solid White sateen duvet by Live Good Inc.
Small Tablo table by Normann Copenhagen, Organic pleated bedding by Loop, Herringbone throw by Boss Home for Hugo Boss, Sailor + Regatta Navy duvet by Unison, Stacked Stones pillow by Coyuchi, Bentwood breakfast tray by West Elm, Riki desk clock by Riki Watanabe. Pillows and duvet loaned by the Company Store. Image courtesy of ©Aya Brackett. Side table by Urban Hardwoods, Rustic Wood serving tray by Grayworks Design, Crushed Silk shams by Eileen Fisher for Garnet Hill, Egg Press Dot sheet set by Schoolhouse Electric & Supply Co., City throw by Bryce & Co., Ines Duvet cover by Area. Image courtesy of ©Aya Brackett. Side table by BoConcept, Dvala sheets by Ikea, Mega Dot quilt by Hay, Lisboa throw by Missoni Home, Bloomsbury Basket Weave Throw by Wallace + Sewell, Color Block pillowcases by Scholten & Baijings for Hay, Red Ceramic clock by George Nelson, Solid White sateen duvet by Live Good Inc. Image courtesy of ©Aya Brackett. Crafted from reclaimed timbers, this bedside stand need not be relegated to the bedroom. It could work as a sculptural piece anywhere. Layer in texture and dimension with this ruched silk sham. We favored the fawn hue, but its sister shades of soft white, oat, and rosewater are also attractive. A hand-printed pattern of dots adorns these 280-thread-count Egyptian cotton sheets. 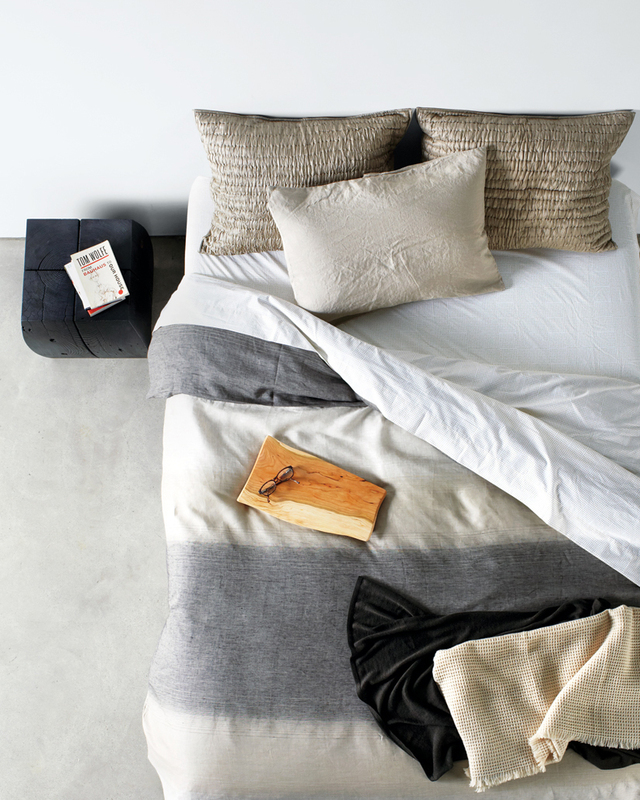 We love the earth-toned gradients in this duvet, shown here in the sand colorway. It’s made from 100 percent linen, a material that wicks away moisture to keep you cool while you slumber. Calling frequent movers: In under five minutes, you can unscrew Tablo’s three ash-wood legs and pack the pieces into a narrow box. Delicate pleats span the width of this organic cotton top sheet and edge the pillowcases, creating a subtle and refined embellishment. Made in India, this throw pillow features a hand-stitched appliqué and buttons made from coconut shells. Ideal for adding a graphic pop to your bedding motif. Woven from baby alpaca, this throw hits a classic note thanks to the herringbone detail running down the edge. This cotton percale duvet has wide stripes on one side and narrow ones on the other—a boon if you like variations on a theme. The lightweight MDF top of this side table can be lifted off its wire base to double as a tray—good news for those who take their breakfast in bed. 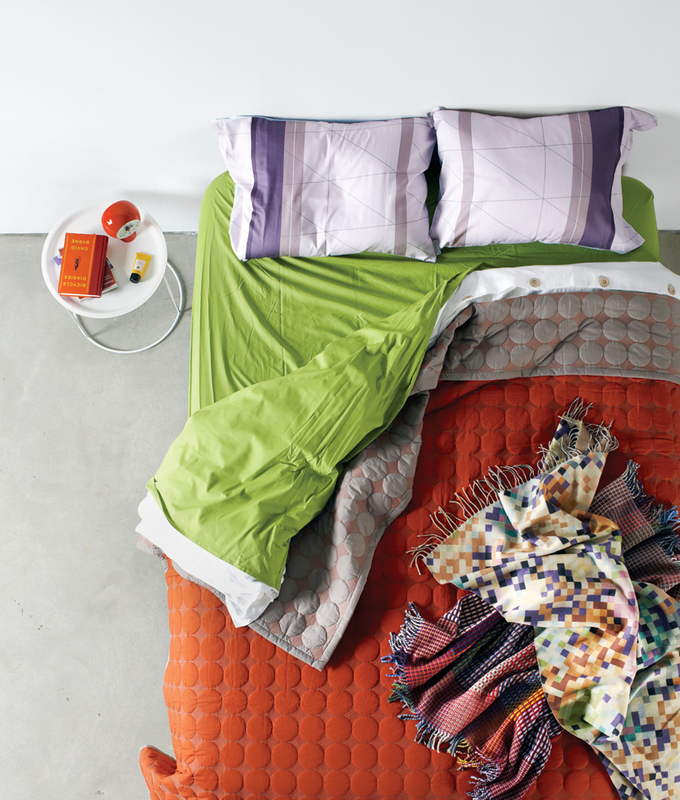 More chic than your average quilt, this mod reversible bed covering boasts bold colors and playful stitching. Three cheers for Live Good’s sustainability commitment. Its finished products and components are made in the United States, like the organic cotton fabric and wooden buttons. From the array of colors to the supersoft lambs-wool to the intricate way the yarns are woven, this covering offers much to rave about. This wool-polyester blanket has a pixelated graphic rendered in muted greens, plums, and blues, and a cozy taupe underside.